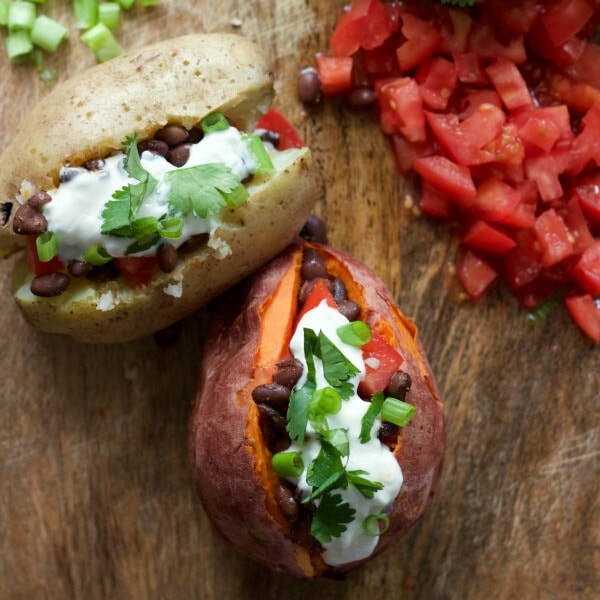 Spice up your baked potato and load it up with fresh tomatoes and beans. Potatoes are a great food to have in your pantry because they last for a long time. Make sure to eat the skin on your potatoes to increase your fiber intake! Microwave potatoes on high 12-15 minutes, order until tender. In microwave-safe bowl, combine beans, tomatoes, oil, cumin, chili powder, and salt. Microwave on high for 2-3 minutes. Slice each potato down the middle. Press open, making a well in the center. Spoon the bean mixture into middle of each potato.